The UK Open, will return to Magnolia Park near to Oxford for the second time to stage the FIFG 500, European Footgolf Grand Slam tournament this weekend with brand new holes and tee positions. The UK Open starts with the practice day on Thursday and The National Pairs Championship kick off on Friday with the final being staged on Saturday night. 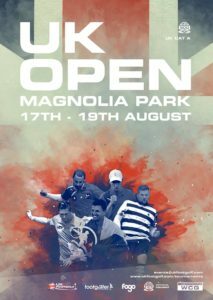 Magnolia Park was re-designed for The UK Open with seven brand new holes including multiple tee options on certain holes. For the first time ever in footgolf players will be able to choose which tee they play from on Hole 18 in The National Pairs PQ on Friday night. No Replies to "The Grand Slam arrives to England"